During our winter 2012 trip to Scandinavia, the highlight of the trip was to see the Northern Lights. Since we flew from faraway Asia, we wanted to pack a lot more into the trip. One of the other highlights while we were in Tromso, was to visit the Polar Zoo. Polar Zoo is one of northern Norways most popular tourist attractions and well known as the worlds most northern zoo. The park uses an area of 114 acres with wild and beautiful nature in Salangsdalen in Bardu, in the county of Troms. These amazing nature surroundings will make your visit in Polar Zoo complete. Our main attraction is Wolf Camp, where you have the possibility to join us inside the wolf enclosure to meet the mythical and legendary wolves close up. The Wolf camp was exactly what we came for. From Tromso, the Polar Zoo is around a 6 hours round trip on the bus from Tromso. Here is the bus timetable. Of course, it is easier if you were to rent a car and drive there. Everything in Norway is expensive!! Our bus round trip cost about SGD$150 each. The entrance to the Polar zoo is the bargain at NOK200 (or SGD$45). Additional charges are: Wolf Camp is Nok800 (SGD$175) and Arctic Fox visit is NOK200. But it was a trip of a lifetime, since we had travelled so far, we cannot let the steep costs deter us. On arriving, we got our tickets and proceeded to walk around the zoo. It was huge, imagine walking around 114 acres in thick snow. For the first 10 minutes, we didn't see any animal, until my husband drew my attention that in one of the large enclosure, a pack of wolves had noticed we were around. They followed and watched our every move. I mentioned to my husband that I hope these were not the wolves we were visiting , as they looked hungry :p.
This is Polar Zoo's biggest attraction. Wolf Camp was established to ensure better welfare of wolves in captivity, knowledge increase, and to offer you a unique wilderness experience. Wolves are genetically afraid of humans. Therefore, non-socialized wolves in captivity are afraid of humans, and lives under stressful conditions. The wolves in Wolf Camp are socialized, and accustomed to associate with humans at close range. These wolves are just like other wolves, except from one thing. They don't fear humans, and enjoy our company as a part of their natural environment. We give you the unique opportunity to meet the wolves in Polar Zoo inside the enclosure! Our staff will be with you all the time and tell you everything you want to know about the wolf. Meet this mythical animal, and discover the actual truth about wolves together with us at Wolf Camp! You must at least 15 years old, dressed for the occasion, be in good physical shape and be able to follow instructions from the animal keeper to enter the wolf enclosure. Polar Zoo's main concern is safety, for both visitors and animals. We were met by 2 guides, Anita is the one who raised the 4 cubs from 7 days old, so she knows what she is talking about. We were instructed to remove anything that might attract the wolves attention as they like to steal things like caps, gloves, scrunchies, spectacles even. My husband and I wore glasses, so we were going in half-blind :p. Rest assured, the zoo does provide you with extra layers if you are under dressed and also provide snow boots for walking in the enclosure as the snow is several layers deep. Finally after 10-15 minutes of preparation, we were ready to go in. Once we reached an area chosen by our guide, we were instructed to crouch down or knee down and waited for the wolves to approach us. They were both curious yet cautious. The guide told us that the wolves have an inbuilt sense to be scared of humans and it is important for their survival. So no sudden movements, just patience. After 5 minutes of waiting and with Anita coaxing them, Luna, one of the females started to approach us after watching us from up on a small hill. Luna approached us after watching us for a while. She first came up and started licking my face - that is the way they greet you. After that she went to the others in the group. There were another couple in addition to the husband and I, plus our 2 guides. It was a nice small intimate group which gave us plenty of time to spend with the pack. Luna came back to me and started smelling my boots. There must be an interesting scent as she proceeded to roll her head onto my boots and started to leave her scent on me. This was a great opportunity to touch her and it was an amazing feeling to stroke a wolf!! At some point, all the wolves left us and to get their attention back, one of the guides started howling which then caused the rest of the wolves around us to howl. Here's a video showing them all howling. It was both eerie yet magical at the same time, how the wolves communicated. We spent almost 1.5 hours in the wolf enclosure with the pack coming back to us again, licking our faces and we got to stroke them. Overall it was an amazing experience which I was glad we were able to experience. It was worth the 6 hours long journey to the zoo and that was not all. There was also an arctic foxes enclosure which you can visit too. This is great especially for the children, as the wolf camp was only open to over 15s. We were lucky that day as there were not many people at the zoo. We had another couple joining us in the Wolf camp and 2 children at the arctic foxes enclosure. The foxes were fun, they were super greedy which helped as the guide handed us some dog kibbles, and the foxes were all over us to try to get the food out of our hands. Everyone enjoyed themselves tremendously. At the zoo, there were other animals ranging from Lynxes, wolverines, reindeers, moose etc. 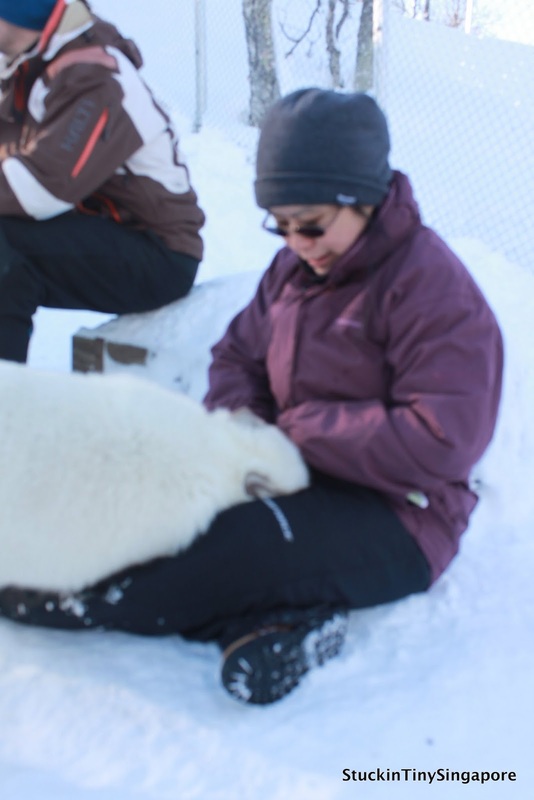 We had only time to see the lynxes and wolverine being fed by Anita. She also took the time to tell us abit more about the animals. Unfortunately, we ran out of time as we had to catch the last bus back to Tromso. All in all, it was a fantabulous day. I would highly recommend if you have extra time on your trip in Tromso to take some time to visit the Polar Zoo. How many days would you recommend stayin gin Tromso for northern lights tour, dog sled and polar zoo?